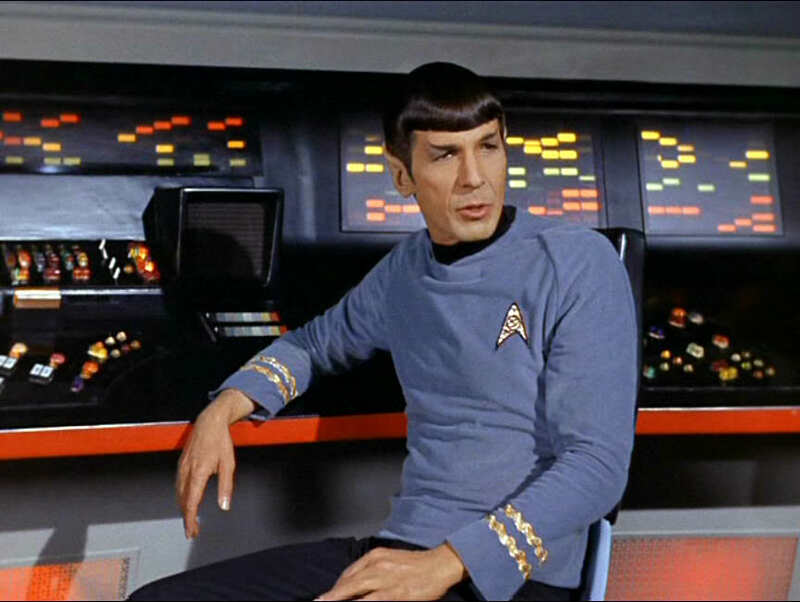 Leonard Nimoy passed away Friday, which led me to revisit some Star Trek The Original Series (TOS) over the weekend. There’s no doubt the influence Mr. Spock had on my childhood. By far my favorite TOS character even then, Spock was a role model for a nerdy little kid who often felt as much an alien as the pointy-eared First Officer of the Enterprise. Emotions are a funny thing when you’re a kid – much of your young life is a struggle to control your anger, your fear, your frustration, and of course usually you fail. In Spock we were presented a man – a hero – who struggled with his own emotions again and again, and who found a way to succeed. On top of that, he was the Science Officer! How cool could you get? One got the feeling that Spock knew everything, and only ever held back so as to make Kirk and the rest feel that they weren’t doing so badly. Having watched a few episodes over the weekend, I can only say – wow, TOS was really, really bad. The dialogue was wooden, the over-the-top dramatic music was matched only by William Shatner’s over-the-top phrasing and bravado, the same jokes were played out again and again and again . . . usually at Spock’s expense. Never, not even in its best moments, did TOS come anywhere near the best of TNG: Darmok; The Inner Light; I, Borg; All Good Things; The Measure of a Man; Chain of Command – and on and on. 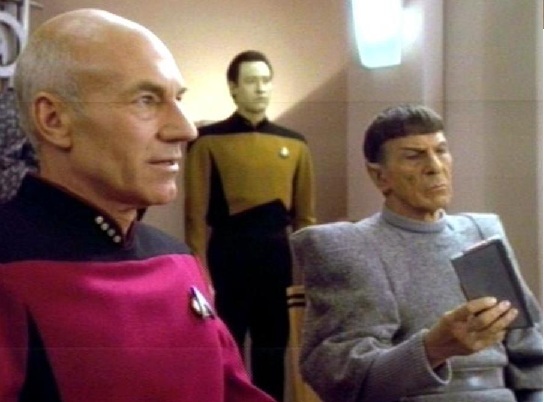 By the way, looking at the list of TNG’s best and one thing is obvious. TNG was Jean-Luc Picard. While TOS explored humanity through the half-human Spock and the ridiculous Kirk, and TNG tried casting Data in the Spock role (and Riker in the Kirk role), I think it bacame quite obvious around Season Three that TNG was Patrick Stewart’s series. He made it special with his skill, his energy, his humanity. Through Stewart’s portrayal of Picard, TNG became something I think no one would have predicted – a true exploration of what it means to live a meaningful human life. OK, this was supposed to be a tribute to Leonard Nimoy and his Mr. Spock. Instead it’s become a celebration of Picard. But maybe that’s fitting. So many people compare and contrast Picard with Kirk that it’s become an internet trope. It occurs to me, though, that it’s the wrong comparison. Spock, with his desire for logic, his love of peace and diplomacy, his boundless curiosity, was the true ancestor of Picard, who shared all those qualities and more. Picard, unlike Spock, wasn’t frightened of his emotions, but he was always in control of them. Picard, unlike Spock, didn’t run from his humanity. Instead, he embraced it, found ways to make it work for him. Picard took what Spock had begun and raised it to new, unexpected heights. So goodbye, Mr. Spock. Thanks for making it possible for us to know Jean-Luc Picard, your true heir.